The AstraZeneca stock price is hovering near $68 after the company presented at the American Society of Clinical Oncology (ASCO) meeting in Chicago this week. ASCO is an annual event that's attended by 30,000 people and hosts more than 4,000 presentations. This year's meeting began on May 29 and ran through June 2. It's the premiere event for companies developing cancer drugs. And every year, some cancer stocks get a serious ASCO-related lift. Money Morning's Executive Editor Bill Patalon calls it the "ASCO Effect." Last year, he recommended Bristol Meyers Squibb Co. (NYSE: BMY) and it climbed 36.5% in the following year. 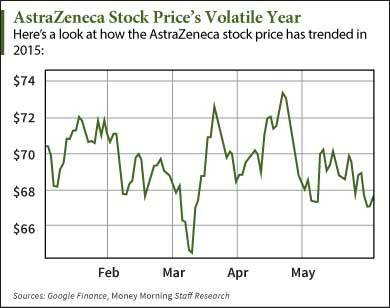 So the question for investors is – will the AstraZeneca Plc. (NYSE ADR: AZN) stock price see a post-ASCO bump? AstraZeneca officials held an investor science event during ASCO this week and provided an update on their immune-oncology pipeline. Immuno-oncology was a major theme of the 2014 ASCO event, according to Patalon. It's a new category of drugs that use the body's own immune cells to target a variety of cancers. The market potential is huge, and Patalon described it as the biotech sector's version of "the California Gold Rush." This week, AstraZeneca announced two of its new immune-oncology drug candidates had seen exciting results. The drugs, MEDI4736 and tremelimumab, are being tested for treatment of non-small-cell lung cancer. The company reported increased response rates in patients with several different types of tumors who have been taking the combination of drugs. AstraZeneca will now advance the combination into phase 3 trials. Completing phase 2 and phase 3 FDA trials can be a major catalyst for biotech stocks. Investors will want to keep a close eye on this combination as it heads into phase 3 trials.